JESUS CHRIST Died For You and He Died For Me. Thank You Jesus ! "Enter by the narrow gate; for the gate is wide, and the way is broad that leads to destruction, and many are those who enter by it. For the gate is small, and the way is narrow that leads to life, and few are those who find it". Originally published in Arizona Medicine , March 1965, Arizona Medical Association. Several years ago I became interested in the physical aspects of the passion, or suffering, of Jesus Christ when I read an account of the crucifixion in Jim Bishop's book, The Day Christ Died. I suddenly realized that I had taken the crucifixion more or less for granted all these years - that I had grown callous to its horror by a too-easy familiarity with the grim details. It finally occurred to me that, as a physician, I did not even know the actual immediate cause of Christ's death. The gospel writers do not help much on this point. Since crucifixion and scourging were so common during their lifetimes, they undoubtedly considered a detailed description superfluous. For that reason we have only the concise words of the evangelists: "Pilate, having scourged Jesus, delivered Him to them to be crucified ... and they crucified Him." Despite the gospel accounts silence on the details of Christ's crucifixion, many have looked into this subject in the past. In my personal study of the event from a medical viewpoint, I am indebted especially to Dr. Pierre Barbet, a French surgeon who did exhaustive historical and experimental research and wrote extensively on the topic. An attempt to examine the infinite psychic and spiritual suffering of the Incarnate God in atonement for the sins of fallen man is beyond the scope of this article. However, the physiological and anatomical aspects of our Lord's passion we can examine in some detail. What did the body of Jesus of Nazareth actually endure during those hours of torture? The physical passion of Christ began in Gethsemane. Of the many aspects of His initial suffering, the one which is of particular physiological interest is the bloody sweat. Interestingly enough, the physician, St. Luke, is the only evangelist to mention this occurrence. He says, "And being in an agony, he prayed the longer. And his sweat became as drops of blood, trickling down upon the ground" (Luke 22:44 KJV). Every attempt imaginable has been used by modern scholars to explain away the phenomenon of bloody sweat, apparently under the mistaken impression that it simply does not occur. A great deal of effort could be saved by consulting the medical literature. Though very rare, the phenomenon of hematidrosis, or bloody sweat, is well documented. Under great emotional stress, tiny capillaries in the sweat glands can break, thus mixing blood with sweat. This process alone could have produced marked weakness and possible shock. Although Jesus' betrayal and arrest are important portions of the passion story, the next event in the account which is significant from a medical perspective is His trial before the Sanhedrin and Caiaphas, the High Priest. Here the first physical trauma was inflicted. A soldier struck Jesus across the face for remaining silent when questioned by Caiaphas. The palace guards then blindfolded Him, mockingly taunted Him to identify them as each passed by, spat on Him, and struck Him in the face. In the early morning, battered and bruised, dehydrated, and worn out from a sleepless night, Jesus was taken across Jerusalem to the Praetorium of the Fortress Antonia, the seat of government of the Procurator of Judea, Pontius Pilate. We are familiar with Pilate's action in attempting to shift responsibility to Herod Antipas, the Tetrarch of Judea. Jesus apparently suffered no physical mistreatment at the hands of Herod and was returned to Pilate. It was then, in response to the outcry of the mob, that Pilate ordered Barabbas released and condemned Jesus to scourging and crucifixion. Preparations for Jesus' scourging were carried out at Caesar's orders. The prisoner was stripped of His clothing and His hands tied to a post above His head. The Roman legionnaire stepped forward with the flagrum, or flagellum, in his hand. This was a short whip consisting of several heavy, leather thongs with two small balls of lead attached near the ends of each. The heavy whip was brought down with full force again and again across Jesus' shoulders, back, and legs. At first the weighted thongs cut through the skin only. Then, as the blows continued, they cut deeper into the subcutaneous tissues, producing first an oozing of blood from the capillaries and veins of the skin and finally spurting arterial bleeding from vessels in the underlying muscles. The half-fainting Jesus was then untied and allowed to slump to the stone pavement, wet with his own blood. The Roman soldiers saw a great joke in this provincial Jew claiming to be a king. They threw a robe across His shoulders and placed a stick in His hand for a scepter. They still needed a crown to make their travesty complete. Small flexible branches covered with long thorns, commonly used for kindling fires in the charcoal braziers in the courtyard, were plaited into the shape of a crude crown. The crown was pressed into his scalp and again there was copious bleeding as the thorns pierced the very vascular tissue. After mocking Him and striking Him across the face, the soldiers took the stick from His hand and struck Him across the head, driving the thorns deeper into His scalp. Finally, they tired of their sadistic sport and tore the robe from His back. The robe had already become adherent to the clots of blood and serum in the wounds, and its removal, just as in the careless removal of a surgical bandage, caused excruciating pain. The wounds again began to bleed. In deference to Jewish custom, the Romans apparently returned His garments. The heavy patibulum of the cross was tied across His shoulders. The procession of the condemned Christ, two thieves, and the execution detail of Roman soldiers headed by a centurion began its slow journey along the route which we know today as the Via Dolorosa. In spite of Jesus' efforts to walk erect, the weight of the heavy wooden beam, together with the shock produced by copious loss of blood, was too much. He stumbled and fell. The rough wood of the beam gouged into the lacerated skin and muscles of the shoulders. He tried to rise, but human muscles had been pushed beyond their endurance. The centurion, anxious to proceed with the crucifixion, selected a stalwart North African onlooker, Simon of Cyrene, to carry the cross. Jesus followed, still bleeding and sweating the cold, clammy sweat of shock. The 650-yard journey from the Fortress Antonia to Golgotha was finally completed. The prisoner was again stripped of His clothing except for a loin cloth which was allowed the Jews. The crucifixion began. Jesus was offered wine mixed with myrrh, a mild analgesic, pain-reliving mixture. He refused the drink. Simon was ordered to place the patibulum on the ground, and Jesus was quickly thrown backward, with His shoulders against the wood. The legionnaire felt for the depression at the front of the wrist. He drove a heavy, square wrought-iron nail through the wrist and deep into the wood. Quickly, he moved to the other side and repeated the action, being careful not to pull the arms too tightly, but to allow some flexion and movement. The patibulum was then lifted into place at the top of the stipes, and the titulus reading "Jesus of Nazareth, King of the Jews" was nailed into place. The left foot was pressed backward against the right foot. With both feet extended, toes down, a nail was driven through the arch of each, leaving the knees moderately flexed. The victim was now crucified. Spasmodically, He was able to push Himself upward to exhale and bring in life-giving oxygen. It was undoubtedly during these periods that He uttered the seven short sentences that are recorded. The first - looking down at the Roman soldiers throwing dice for His seamless garment: "Father, forgive them for they do not know what they do." The second - to the penitent thief: "Today, thou shalt be with me in Paradise." The third - looking down at Mary His mother, He said: "Woman, behold your son." Then turning to the terrified, grief-stricken adolescent John , the beloved apostle, He said: "Behold your mother." The fourth cry is from the beginning of Psalm 22: "My God, My God, why have You forsaken Me?" The prophecy in Psalm 22:14 was being fulfilled: "I am poured out like water, and all my bones are out of joint, my heart is like wax; it is melted in the midst of my bowels." The end was rapidly approaching. The loss of tissue fluids had reached a critical level; the compressed heart was struggling to pump heavy, thick, sluggish blood to the tissues, and the tortured lungs were making a frantic effort to inhale small gulps of air. The markedly dehydrated tissues sent their flood of stimuli to the brain. Jesus gasped His fifth cry: "I thirst." Again we read in the prophetic psalm: "My strength is dried up like a potsherd; my tongue cleaveth to my jaws; and thou has brought me into the dust of death" (Psalm 22:15 KJV). A sponge soaked in posca, the cheap, sour wine that was the staple drink of the Roman legionnaires, was lifted to Jesus' lips. His body was now in extremis, and He could feel the chill of death creeping through His tissues. This realization brought forth His sixth word, possibly little more than a tortured whisper: "It is finished." His mission of atonement had been completed. Finally, He could allow His body to die. With one last surge of strength, He once again pressed His torn feet against the nail, straightened His legs, took a deeper breath, and uttered His seventh and last cry: "Father, into Your hands I commit My spirit." The common method of ending a crucifixion was by crurifracture, the breaking of the bones of the leg. This prevented the victim from pushing himself upward; the tension could not be relieved from the muscles of the chest, and rapid suffocation occurred. The legs of the two thieves were broken, but when the soldiers approached Jesus, they saw that this was unnecessary. Apparently, to make doubly sure of death, the legionnaire drove his lance between the ribs, upward through the pericardium and into the heart. John 19:34 states, "And immediately there came out blood and water." Thus there was an escape of watery fluid from the sac surrounding the heart and the blood of the interior of the heart. This is rather conclusive post-mortem evidence that Jesus died, not the usual crucifixion death by suffocation, but of heart failure due to shock and constriction of the heart by fluid in the pericardium. In these events, we have seen a glimpse of the epitome of evil that man can exhibit toward his fellow man and toward God. This is an ugly sight and is likely to leave us despondent and depressed. But the crucifixion was not the end of the story. How grateful we can be that we have a sequel: a glimpse of the infinite mercy of God toward man--the gift of atonement, the miracle of the resurrection, and the expectation of Easter morning. "God Bless the writer of these words, that we all may come to understand the suffering our Lord endured for each and everyone of us"
Judy and her husband Bob follow the teachings of Jesus Christ and believe in the plan of salvation as written in the Bible. Christ himself went into the wilderness to seek solitude and commune with the Father. 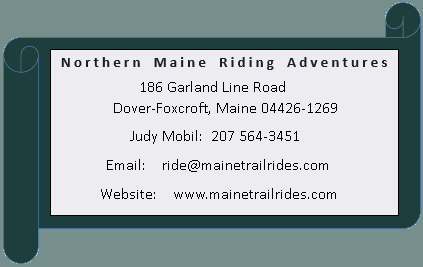 At Northern Maine Riding Adventures we feel the presence of our creator so strongly in the mountains and forests where we give praise for his presence in our lives. Join us for a weekend of riding, canoeing, fishing, and worship in one of the few areas left not cluttered by the noise and confusion of our everyday world. come quiet your heart and feel the presence of our God. Our Christian weekends are a safe rewarding experience of bringing family's together in the wilderness with our Lord. Hear his voice as you spend quiet time with the mystery of the horse. Soar to greater heights as you put your trust in God "The Creator" and in his creation to carry you safely. We pray, we ride, we worship, and we are at peace. We want to share the blessings that we all have received from "HIM" with you. Psalm 36, verses 5 - 6. Lord, your constant love reaches the heavens; your faithfulness extends to the skies. Your righteousness is towering like the mountains; your justice is like the depths of the sea. Men and animals are in your care. We believe in the New England Tradition of positive human values, hard work, honesty and old style family traditions, based on Biblical principles. Judy Cross has been teaching riding for over thirty years. Her early training was in Western and trail riding. She was introduced to Dressage and Combined Training thru Pony Club in Maine as a teenager. During college in Equine Science, she started competing in Combined Training Events. As a young professional rider and instructor, she was coached by members of the US Olympic Three Day Team. She continued to compete herself and coach young riders for over 25 years. In 1979 after riding and teaching professionally, Judy returned to Maine for surgery to correct congenital bone defects in her feet. As she was returning to riding, she had the opportunity to take a clinic with well known author and instructor Sally Swift. This was a life changing experience for Judy and she began to pursue the Centered Riding path by studying extensively with Sally. She became an Advanced level IV instructor in 1999, one of only 17 in the US and Europe. Judy's own struggle with chronic back pain and incorrect habitual posture gives her a unique perspective in helping others over come physical challenges that prevent them from achieving their riding goals. This path led her to Therapeutic Riding. In 1980 she started one of the first Therapeutic Riding Programs in Maine after attending the Cheff Center. She became a NARHA member in 1984 and is currently the co-chair for the State of Maine. She is an EFMHA member and offers Adventure Based Learning programs out of her facility in Dover-Foxcroft, Maine. She and her husband Bob Strehlke run an active boarding stable, offer wilderness trail rides, and teach children with learning disabilities and mental health challenges. Judy's special interest is on children on the autism spectrum. The personal growth workshops for women at Northern Maine Riding Adventures incorporates a synergistic new form that blends riding with reflective round pen work assisted by a therapist. This unique combination releases the power of the Mind/Body connection to access emotional and physical issues using much of the Epona methods. She incorporates Brain Gym and Centered Riding body work in all her lessons. Judy's studies on the bio mechanics of riding and habitual holding patterns in the body include Ti Chi, Alexander Techniques, Neuro pathway work through Feldenkris and TEAM, Centered Riding and Brain Gym. She is an advanced NARHA instructor and an Advanced Level IV Centered Riding Clinician. 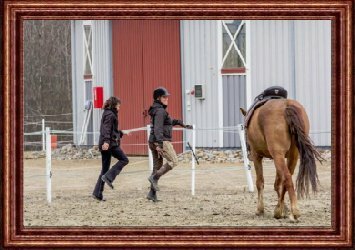 She currently teaches Centered Riding to instructors throughout the US and Europe and Integrated Riding Techniques the physio- therapists all over Europe and The US. Centered Riding® is a method of riding that can improve the balance and Relaxation of every rider regardless of what discipline they ride. This method has been taught to western, to saddle seat, for dressage and combined training, for hunters, and for the disabled and for jumping. Judith Cross-Strehlke has been teaching and following the discipline of "Centered Riding® Since 1980 when Sally Swift first started teaching in Maine. 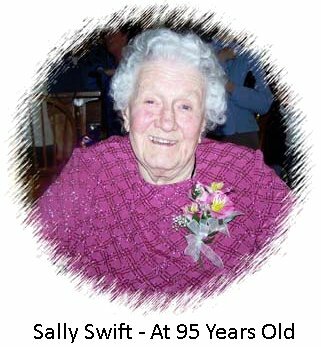 Judy has had the good fortune to have been trained by Sally Swift extensively over the last 20 years and is currently certified as a Level IV Instructor and clinician. For more information about Centered Riding®, click here . Integrated Riding™ is a unique blend of Movement Based Learning activities used to increase the neruo sensory reactions in the Brain to facilitate whatever learning activity is taking place. This innovative use of Brain Gym, Centered Riding, and Balimo activities, based on the work of Eckhart Meyners, includes exercises on the ground and on the horse. This combination enhances whole brain activity to combine kinetic learning, necessary for improved riding skills, with cognitive learning, necessary for technical skills. Habitual posturing and movement creates one set of overdeveloped nerve pathways. This interferes with the body's ability to learn a new movement because of the impact habituation has on the brain's ability to send information to the muscles through the different nerve pathways. By using a combination of specific types of exercises in a riding lesson, the emotional centers in the brain are blended with the body to access the whole Brain This allows a blend of improved physical and cognitive learning. Emotional stress whether through trauma or abuse, creates a blockage in the body's ability to balance physically. Hands on contact, combined with relaxation techniques, helps the body release these holding patterns which in turn opens up the body's ability to learn. Actively moving the body in a new way retrains the nervous system to improve balance and movement.Certain exercises and types of touch help to stimulate areas of the brain responsible for our survival responses and our emotional reactions to situations. When we move a certain way, we enhance our ability to balance what our body feels with what our senses tell us. When we blend riding and handling horses with certain exercises, we provide physical stimulation that increases Neruo pathway development. These easy to do exercises enhance the ability to learn to process information and respond to the world around us in a positive and effective way.A 6 point program taken from the Balimo System helps to develop the neural connections in the brain which are essential for riding. The exercises are appropriate for all ages and levels of learning.Targeting 6 specific areas of the body through certain exercises help reduce stress and retrain the brain for greater integration of balance and movement. Riders of all abilities are able to reduce stiffness, develop greater balance, and increase tone and flexibility. For more information about Integrated Riding™, click here . The Journey is a unique co-operation between three international instructors, each experts in their own fields. It is a three year training program, which covers the essential elements that come together with working with horses. Piet Nibbelink will guide you through the first part of the program, where you will learn about communication between horse and human. 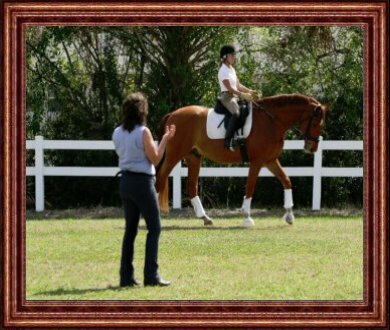 Judy Cross-Strehlke (USA) is a level IV Centered Riding instructor and will guide you through part two, which is about body awareness and effective movement in riding. The third and last part will be guided by Sarah Jane Clarke, a classical dressage specialist trained by the riding school in Jerez. She will teach you about training horses. For more information about the journey, click here .